Re clocking to minimize transmitter timing errors. Automatically adjust to import rate. 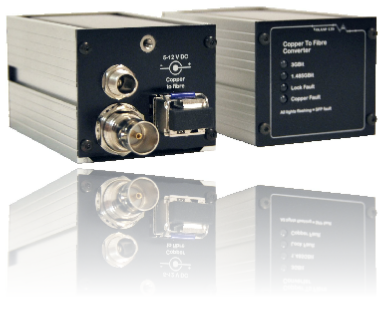 The video fibre optic transmitter is a high speed digital fibre optic transmitter which, when used in conjunction with our video fibre optic receiver, will allow the extension of SDI / HDI links up to 4 Km. To achieve maximum distance the transmitter will launch into single mode fibre at a wavelength of 1310nm . Option available to launch at 1550nm. Designed to support SMPTE 292M and SMPTE 344M it is optimized for performance at 270Mb/s and 1.485Gb/s. SMPTE pathological test patterns are supported. 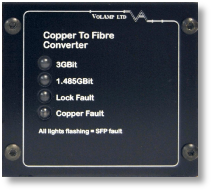 The fibre optic output wavelength can be 850nm or between 1200 - 1600nm. Copper input is by a standard 75 Ohm BNC connector. Front panel status indicators are providing module status independent of unit orientation within rack. Distance achievable with suitable receiver.